Despite our culture’s shift away from playtime, the field of play therapy is growing. Discover why children may need play therapy now more than ever. Social workers and other therapists have long used forms of play to communicate with younger clients, but to actually be trained in play therapy means following a prescribed model to help meet the needs of those clients. 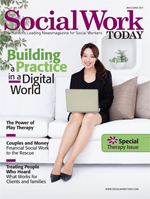 It’s a field that many social workers may be considering. Still, in a culture where play is becoming less valued—for myriad reasons that are not limited to busy parents and the advent of high-tech video games—can a field focusing on therapy through play survive? The experts say the answer is not only “yes,” but that these reasons are why play therapy may be so successful—and so important today. And as more social workers and other professionals begin to take note of its importance, the field of play therapy is poised to grow. There’s a lot more to playtime than fun and games. While that’s what it should be about for a child, it’s also an opportunity for adults to reach children on their own level. “Freud believed he could understand children by watching them play,” says Theresa Aiello, PhD, coordinator of the Child & Family Focused Learning Opportunity Program and codirector of the Advanced Certificate in Child and Family Therapy at New York University Silver School of Social Work. “Play is a form of free association for children, but it’s also a way of understanding how the child develops a sense of self. There are many forms of play therapy. In child-centered play therapy, the therapist observes as the child is allowed to select from an array of toys and play whichever way he or she likes. In sand tray play therapy, which is becoming increasingly popular with registered play therapists (RPTs), the child may use figurines to develop scenes in the sand. In filial play therapy, the parents get involved and the therapist actually teaches the parents how to interact with the child through play—hopefully closing a communication gap that may have existed. Though some children may benefit from play therapy more than others, most play therapists argue that the practice would be suitable for any child. “Any child that has any sort of problem they need to discuss or be able to process would make a good candidate for play therapy,” says Elena Mazza, MSW, LCSW, an assistant professor in the play therapy program, coordinator in the School of Social Work at Monmouth University in West Long Branch, NJ. Mary Anne Peabody, LCSW, RPT-S, deputy director of national services at the Children’s Institute associated with the University of Rochester in New York, says it’s young children who will benefit most from play therapy, as they are the ones who don’t have well-developed abstract thinking skills to process issues or the verbalization skills to discuss them. But she says play therapy can change with the age of the child and still be quite successful with older children as well as into adulthood. The idea of being in control of the play can help give a child confidence. Since the child may feel out of control with the events playing out in the rest of his or her life, that sense of control during playtime is important. Aiello says the play itself can also be helpful. As play therapy becomes more respected among social workers and other professionals, there’s a simultaneous shift away from play in other areas of our culture. Educational toys in elementary classrooms are being replaced by computers, and some schools have cut recess short or even eliminated it. But it’s not only schools that are eliminating play opportunities—it’s happening at home, too. According to a 2010 survey by the Kaiser Family Foundation, children spend an average of 7 hours and 38 minutes a day in front a screen. The movement away from play at school and at home is also affecting how parents let their children play. At home, working parents are often too busy for playtime and may not be willing to deal with the mess that imaginative play creates. Sometimes television seems easier. Mitschelen says this makes filial play therapy incredibly important so that parents can learn how to play with their kids. While the experts say the field of play therapy is growing, there’s still a need for understanding. Many are still not aware that the training to become an RPT is fairly extensive. The individual must have earned a master’s or higher in a mental health field and have completed at least 150 hours of play therapy-specific instruction as well as at least 500 hours of supervised play therapy experience, among other requirements. So what’s the future of play therapy? The field seems to be growing as more enroll in the advanced certificate programs being offered at universities and more universities begin offering such programs. — Lindsey Getz is a freelance writer based in Royersford, PA, and frequent contributor to Social Work Today.